April 2012. Joseph Kennedy – grand-nephew of John F. Kennedy – lives in an America occupied in the East by Greater Germany and on the West Coast by Imperial Japan. He is one of six people who can restore history to its rightful order — even though it would mean his own death. 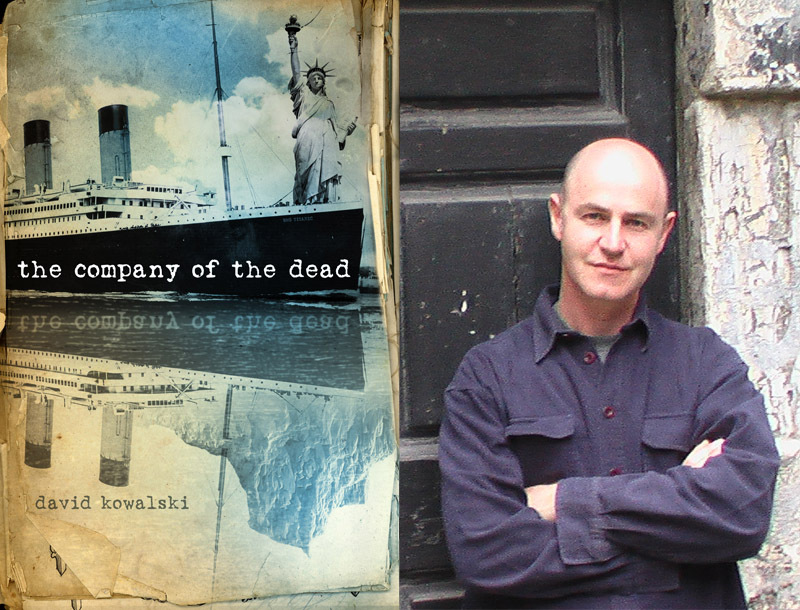 These are questions that debut author David Kowalski both asks and answers in his complex and intricately plotted alternate historical novel, The Company of the Dead. In a mere 752 pages (!) the book combines conspiracies, time travel, science fiction, and historical drama into an exciting, action-packed adventure that you’ll have a hard time pulling yourself away from. FOG! caught up with David last week and we talked about his other career, his influences and the editing process. You work professionally as a medical practitioner. Growing up, were you interested in being a writer or is it an interest that developed when you were already involved in medicine? When I was in fifth grade (aged 10) I wrote a Doctor Who story, that I still have, involving the Doctor battling Daleks, Cybermen and Sontarans. It was called the Triple Threat and I even illustrated it. My mother thought it was a tour de force, yet surprisingly, it remains in publication limbo. I always wanted to write but most of my favourite authors had come to writing by bad directions from other fields. I also (apparently) always wanted to do medicine. I loved Chekov, Conan Doyle, Maugham, Bulgakov, Carlos Williams. There is a rich tradition of doctors who turned to writing. I suppose that I hoped to be one of them. Your book features an alternate timeline. Did history prompt the initial ideas or did your research fuel your imagination? Were there any historical facts that you came across that you previously were unaware of that you discovered and incorporated? I have always been interested in history, both real and counterfactual. For me, loving history involves wondering how things may have turned out. I started out writing about the Titanic as I was as fascinated with the phenomenon of the interest people took in the sinking as much as in the sinking itself. The ship and its story are virtually our first modern fable. There were a few facts I discovered, that dovetailed with where I wanted my story to go. Stead, the mystic who guides some of my characters on the Titanic actually sailed on her. He was a writer with a profound interest in the occult. Some of the political movements that succeed in the world of the novel, failed in our own, and have been carefully brushed under the carpet. Have you been a fan of alternative historical fiction prior, or was it just a genre that lent itself to this story? I am more interested in the factual books, written by historians, that examine possible alternate outcomes. Having said that I have read a few great works that involve alternate time-lines; Turtledove’s Guns of the South, Robert’s Pavane, the graphic novel, Pax Romana, by Hickman is also brilliant. And of course, Alan Moore’s Watchmen. I try to read widely. You’re from Australia. Did you visit the United States during the writing of the book and did you seek out any specific locations that you wanted to use? I had stayed at the Waldorf Astoria, years ago. At the time I had researched the Astor’s widely, for my writing. Talking to the concierge, as I was booking in, I must have impressed or surprised him. We were upgraded to the Astoria lounge which I later used as a setting in the book. I’d also stayed at the Flamingo, in Vegas, which also features in the book. Before this starts to sound too much like a series of plugs, I’ll say that I also went driving around Roswell when I was in Nevada. I’d read a lot about the area, particularly looking to its geography, it was great to be able to get a first hand feel for the place. To date I have never been on the Titanic. Did the story change significantly during the rewrite process? Are there any favorite plotlines or story points that were edited out? Seriously great questions, thank you. The story definitely changed as it grew, in some places quite significantly. I believe that with most creative works, novels, films, so on, there is a certain critical mass to the thing. Once that happened in Company, changes occurred because they had to. They grew out of the substance of the work. Does that sound too weird? To answer your second question, I removed my favourite chapter during the last edit. That was difficult. I loved it and still do (and occasionally I send it out to readers if they ask me nicely). It sat bang in the centre of the novel and structurally was the center around which the whole story revolved. The problem was that it was in the first person, directly addressing the reader. It interrupted the flow of the novel significantly and took away more than it added. It also clarified a plot point that I needed to keep muddy for the time being. Removing it taught me a lot about writing. Occasionally positively. I read a lot of graphic novels and I have certainly been inspired by the work of Grant Morrison, Neil Gaiman and Alan Moore. I looked at T.S. Eliot’s The Wasteland for Company’s structure. I try and assign myself a couple of classics a year so I can tell myself I am reading well and I look to the ambition and achievements of writers like Joyce, Melville and Proust, to see what can be done if you are unbalanced and inspired. Since writing Company, and whilst working on my new book I have met Anna Tambour, the best writer you probably haven’t read (her new book, Crandolin, hits the shelves soon!). She keeps me working, writing and honest. This was supposed to be finished already, but I only came up with the ending a few months ago. It’s more fantasy than sci-fi but will have a dash of science to it. Working title: The Golden Age. What aren’t I geeking out over? I’m hanging out for 2012 Doctor Who and Game of Thrones Season 2. I just finished reading Gaiman’s American Gods, which I seriously loved. Key and Peele are this astonishing comedy duo from the States that manage to hit a healthy balance of high and low brow. Speaking of which I’ve yet to see the second season of Todd Margaret. And John Carter opens any day now here in Sydney.